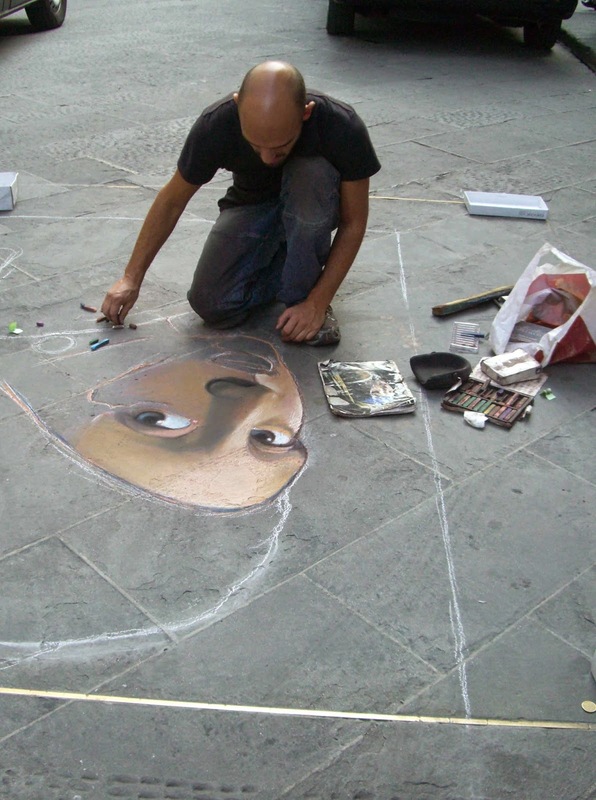 In Florence, as in many cities, the street artists emerge with the gentler weather and remain until chilly rains and winds force them indoors. Some, like this man, specialize in one particular artwork, repeating it over and over each day. During the course of several days, I saw him tackle Vermeer's "Girl With a Pearl Earring" using a shopworn magazine cover as his guide. Walking past him at different times of the day, I watched him rough in the shapes, lay down the base colors in broad, dusty strokes then blend and highlight the face. It was a good lesson on the technicalities of using pastels and also a reminder that skill comes with repetition. I put a coin in his box and hoped his knees will hold out for the rest of the season.